The most expensive Queens condominium project approved for marketing during the second quarter came in at just over $29 million, according to an analysis of accepted condo plans by New York State Attorney General’s office. 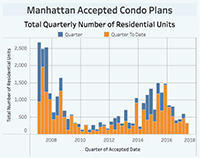 In all, the AG’s office signed off on sales plans for six Queens condo projects totaling $93 million during the second quarter, a massive drop from the $454 million accepted in the second quarter of 2016, an analysis by TRData shows. In the first quarter of this year, $170 million across nine projects received the green light. The biggest project approved this quarter was WFI Realty Company’s $29.12 million project at 87-22 51st Avenue in Elmhurst. It was followed by the Slate condominium in Astoria, which has a projected sellout just over $22 million. 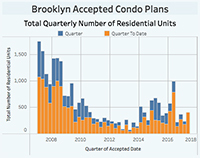 If there’s any trend to be found in the Queens condo pipeline in this cycle, it’s that there are significant fluctuations in both units accepted and the value of projected sellouts. Since the start of 2016, total sales volumes per quarter has dipped as low as $23 million and reached as high as $522 million. 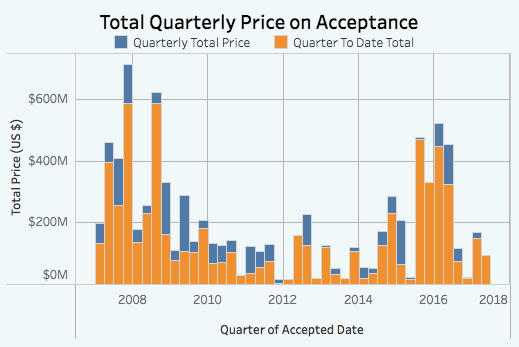 In this cycle, the second half of 2015 and the first half of 2016 saw the highest total year of accepted prices, as illustrated in the chart above. In the first quarter of 2016, 607 residential units were produced, the highest number since 939 units in the third quarter of 2008. In the second quarter of this year, just 123 residential units were accepted. At the slowest point of the cycle, in the fourth quarter of 2016, just 23 units were approved for marketing.